All this talk of #FlagshipFebruary and go-to favorite beers got me thinking about some of the classics I’ve loved—and those I haven’t spent enough time drinking. Top-of-the-list in that second category is Widmer Brothers Hefeweizen, a multi-award-winning wheat beer that, for reasons I swear I can’t explain, hit my radar way later than it should have. Widmer Hefeweizen is in a league with beers like Deschutes Black Butte Porter and Goose Island Honkers Ale as early beers that opened American drinkers’ eyes and taste buds to something more flavorful than the mass-market lagers that monopolized shelves in the ’70s and ’80s. 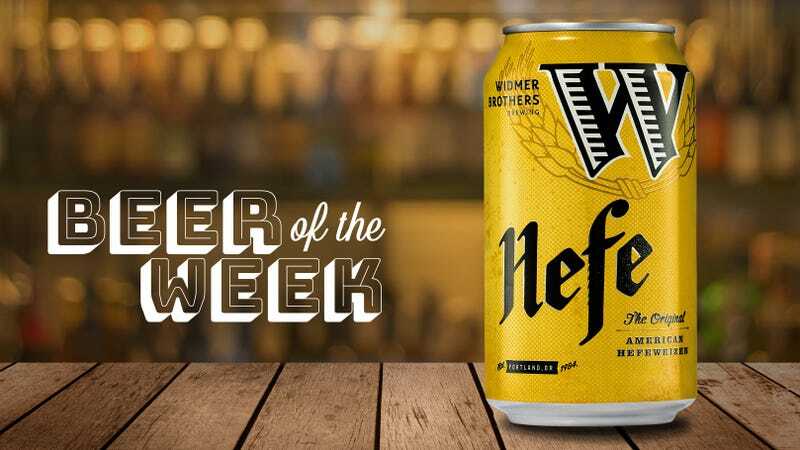 First brewed in 1986 by Portland, Oregon-based Widmer Brothers, Hefe could easily claim a place on Craft Beer Mt. Rushmore, if such a thing existed. Despite its reputation as a pioneer and a staple of American craft beer, this beer didn’t touch my taste buds until the last few years. Don’t burn me at the stake! I can explain! I reached beer-drinking age while living in Chicago, which had its own hometown hero wheat beer: Goose Island 312. Similar to Hefe, that “urban wheat ale” took a traditional German hefeweizen but streamlined it a little, making it more easy-drinking, less intensely yeast-driven, and sprinkling in a few more hops to please American palates. MillerCoors’ Blue Moon also dominated the wheat beer universe at the time—there was just no room in Chicago for a West Coast-brewed wheat beer, it seems. Then I moved to the Mountain time zone—the forgotten time zone—and had my Hefe revelation. I don’t think I literally asked where it had been all my life, but I probably uttered something to that effect. The aroma offers the best of both a hefeweizen and an American wheat beer: banana, lemon zest, light clove, doughy bread, all expertly dialed so that no one element takes over. Those aromas might prepare you for a relatively full sip, but the actual texture and flavor of the beer is more easy-drinking than the aroma lets on. Wheat and pale malts mean lemon and white bread form the bulk of the flavor, with some floral hops and yeast-derived pear notes accenting the grains. Texturally, wheat gives the liquid a bit of a soft, fuller quality, but just the right amount of carbonation keeps this beer refreshing, not heavy. Even if you already have a favorite wheat beer, it’s worth introducing yourself to Hefe. So few beers can act as a thread between the early days of the American craft beer world and its contemporary iteration and still taste entirely relevant. Hefe is one such beer. I’ll be drinking it regularly this winter and spring, just making up for all that lost time. Widmer Brothers Hefeweizen is available year-round in Oregon, Washington, California, Nevada, Colorado, Idaho, Wyoming, Arizona, Utah, and Montana. Locate a retailer with the brewery’s beer-finder tool.